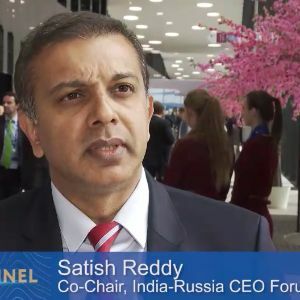 India is the guest country at St. Petersburg International Economic Forum (SPIEF) 2017. The Prime Minister of India is the Guest of Honour as India and Russia celebrate 70 years of diplomatic relations. The relationship has progressed beyond the traditional pillars of defence and space to a robust civil nuclear cooperation, collaboration in the sphere of hydrocarbons as well as long-term LNG sourcing interest. Work on the hydrocarbon energy pipeline and cooperation in renewable energy sector constitute a promising "energy bridge” between the two countries. More recently, Russia has shown interest in the development of infrastructure in India with an intent to invest in Indian Railways, shipbuilding, urban development and transport & logistics. 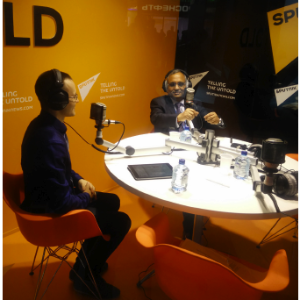 The Make in India initiative, aimed to transform India into a global design and manufacturing hub, is the theme of the ‘India lounge’ at SPIEF 2017. Showcasing Make in India-related and sector-specific achievements, the lounge will also highlight investment opportunities for potential partners abroad. Laid out in five semi-octagonal zones with media screens and interactive spots, the lounge will be open to all participants interested in exploring investment and trade opportunities in India. 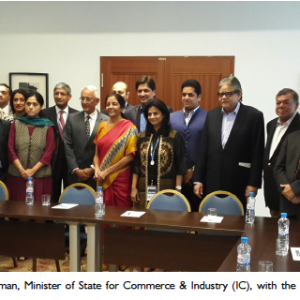 Seminars discussing opportunities in Indian states and sectors will also be conducted. 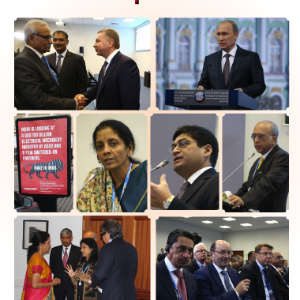 The Indian delegation at SPIEF will comprise of senior government officials and industry leaders. A ‘Media Forum’, with Indian and Russian media, has been planned to kick-off the Make in India lounge. A business breakfast, planned between the member states of the Eurasian Economic Union (EAEU) and India, will present an opportunity for direct dialogue through which current issues and prospects of economic collaboration would be discussed. Day 1: Sessions devoted to three Indian states highlighting key initiatives promoting industrial development along with investment opportunities. Day 2: India-Russia Business Dialogue will showcase opportunities for Russian industries in India as well as Indian companies to consider setting up manufacturing units in Russia. Day 2 & 3: Sessions exploring opportunities in aerospace & defence, infrastructure and capital goods, all of which are focus sectors from the perspective of Indo-Russian synergies. 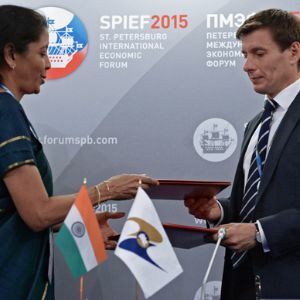 India has been participating in SPIEF since 2011. 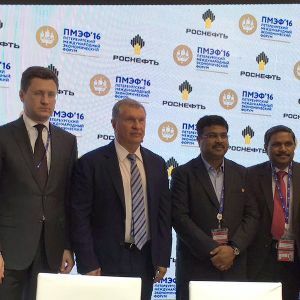 The Indian delegation at SPIEF 2016 was led by India’s Petroleum & Natural Gas Minister and other senior officials from the government as well as notable business leaders. 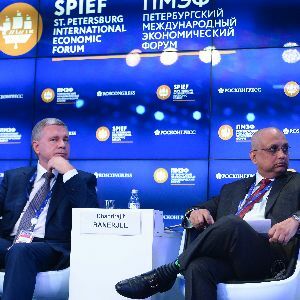 A session themed “Russia-India: A New Stage in Economic Participation” focused on discussing major trends and characteristics of the economic and trade relationship between the two countries. The session looked at ways to streamline and strengthen the dialogue mechanisms for economic cooperation among the two countries, on the sidelines of the $30 billion mutual trade target set to be achieved by 2020. The session on “Global Growth Engines – Who’s Next” explored who among the emerging economies would be the next growth driver in an otherwise sluggish global economy. The discussion highlighted multiple factors that are driving India’s growth story. 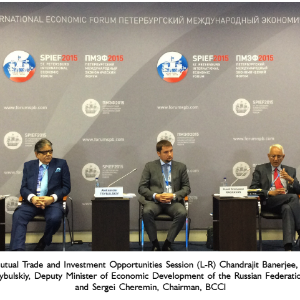 At SPIEF 2015, the Minister of States for Commerce and Industry led the Indian delegation. The Minister addressed the Russia-India Roundtable and an MoU was signed to strengthen bilateral economic cooperation between India and Russia. Use of the 'Make in India' logo is strictly prohibited wihtout permission of DIPP.